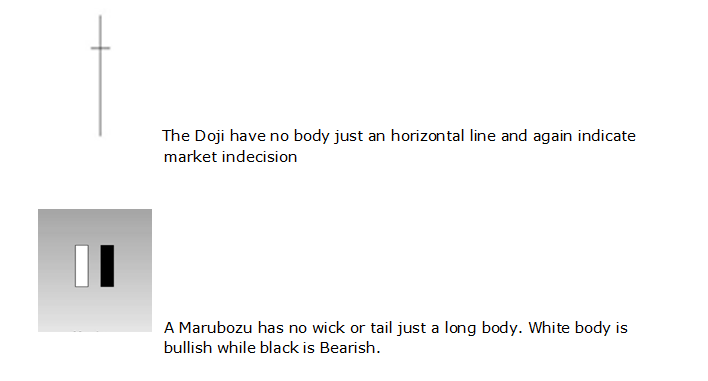 Although candlesticks theory was invented over three hundred years ago by a Japanese rice trader named Sokyu Honma it is still considered to be so useful and relevant to present day trading that many Forex strategies are based on its concepts. A candlestick consists of four main parts which are its opening value, highest value, lowest value and closing values. The distance between a candlestick’s opening and closing prices is called the ‘real body’. When price closes higher than its opening value, the color of the real body is white and the candle is considered to be bullish. The distance between the highest value and the closing value of a bullish candlestick is termed the ‘wick’. The distance between the lowest value and opening value is called the ‘tail’. An example of a bullish candlestick is shown in the next diagram. 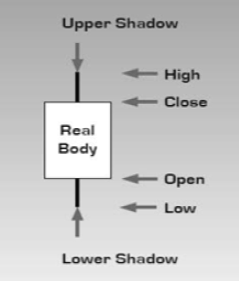 When the candlestick’s body is black then it represents a bearish movement with price closing at a lower value than its opening one. The following diagram presents a bearish candlestick. A candlestick can have many shapes and each with its own interpretation. Here are some of the most famous patterns. 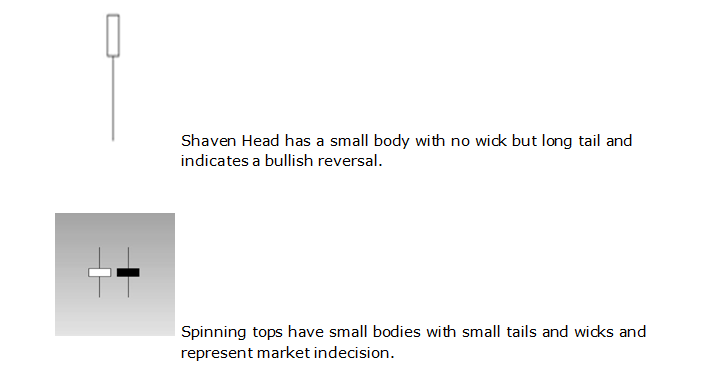 A candlestick is created as described above for every time frame selected. For example, if you have selected the one hour time frame, then each candlestick will display the trading activity over a period of hour. A trading chart can therefore show a large number of candlesticks as shown in the next diagram. Many candlestick patterns exist and have been extensively studied over a considerable period of time. Candlesticks have earned an excellent track record at detecting major changes in price direction such as retracements and reversals. Candlestick patterns are relatively easy to understand and analyze. As candlestick patterns are visually distinctive, they can be readily detected on trading charts. This hammer consists of one candlestick that drops significantly after opening only to rebound above its mid-point. The hammer has no wick but its tail is usually twice the size of its body. The hammer develops at the end of downward channels and implies that the upward momentum could be so strong that it may terminate the current bear trend. In the following diagram, a hammer is displayed as the central candlestick. This pattern consists of two candlesticks and is a strong indication that a downward trading channel could be terminating. The first candlestick possesses a smallish black body. The second has a much larger white body which completely engulfs the real body of the preceding candlestick. The following diagram shows an example. This pattern consists of two candlesticks and is a strong indication that an upward trading channel could be terminating. The first candlestick possesses a smallish white body. The second has a much larger black body that completely engulfs the real body of the preceding candlestick. The following diagram shows an example. A sample candlestick strategy will now be presented based on the Bearish and Bullish Engulfing Patterns. This strategy produces better results when price is range trading. The timeframe chosen is the Daily. 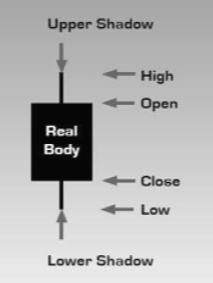 The main technical indicators are the Bearish and Bullish Engulfing Patterns. The exponential moving averages, EMA9 and EMA50 are used to confirm the birth of a new trend. Open the daily USD/CHF trading chart and activate the EMA9 and EMA50 technical indicators. 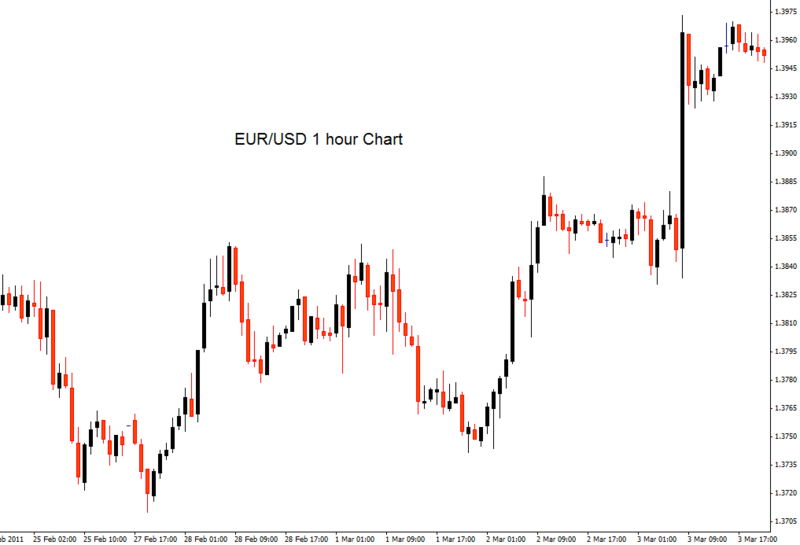 The next chart displays an example setup. 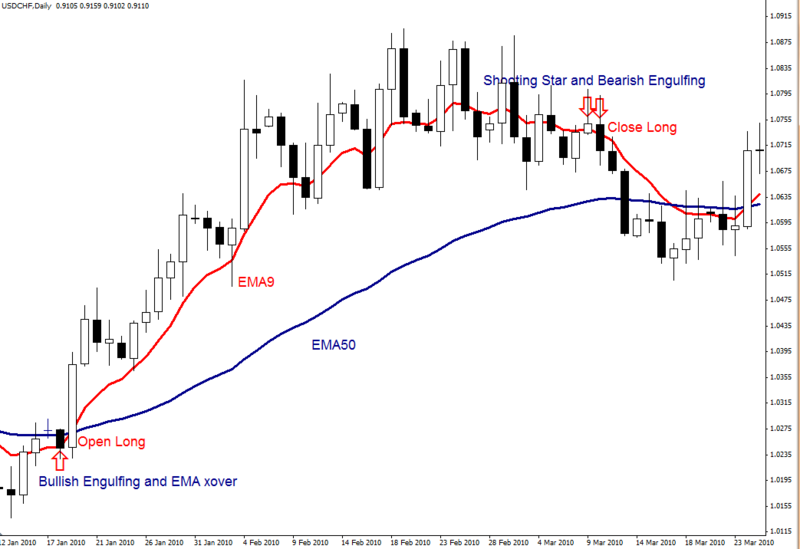 A new long position was opened towards the bottom left of the chart after a bullish engulfing pattern was formed and EMA9 crossed above EMA50. The long trade was closed after a shooting star and bearish engulfing pattern were detected as shown in the top right of the chart. You can design a powerful strategy based on candlesticks by utilizing the concepts expressed in this article. In addition, you will find that once you have mastered the use of a powerful Forex trading methodology that you will soon acquire the skills to design successful candlestick strategies.